PRAYER PROMPT ••• A few years ago, I emailed my closest friend a prayer request. The phrase stuck with me. While I know she didn’t coin the phrase, it’s one of those things I associate with her and the powerful lesson she unknowingly gave me. Because prayers, like viral, quick-spreading emails, can have a far reach. Especially in the hands of committed Christians who take prayer seriously. Now, being honest, how often do you actually remember to add them to your prayers? I realized this about myself a few months ago when I heard myself promising to pray for a situation, and I realized how rarely I follow through. The thing about God — the communication lines are open 24/7. We don’t have to wait until a designated prayer time. 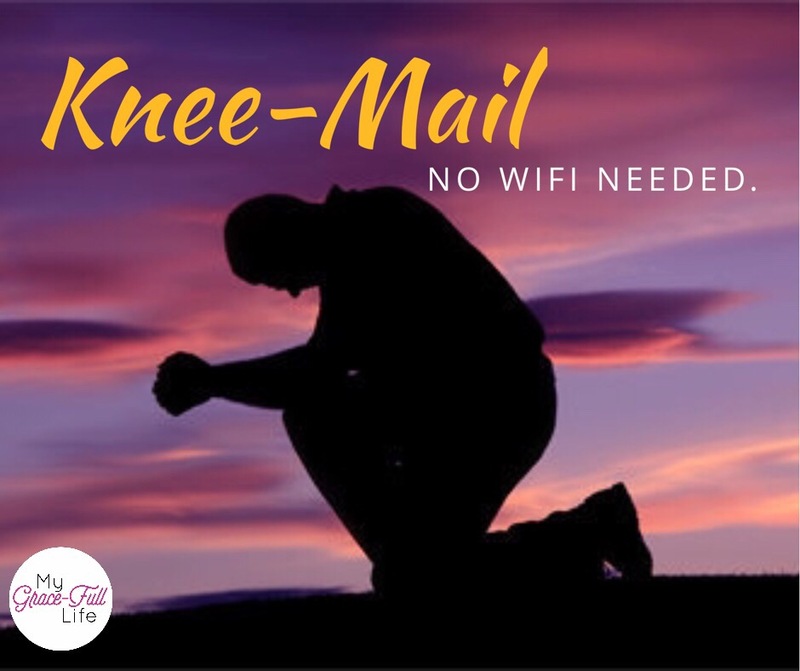 Just as you may send emails throughout the day, so should we send knee-mails to God all the time! Since my Ah-Ha moment, I’ve been trying a different approach: when I say I’m going to pray for someone, I don’t wait. I do it on the spot. As I’ve worked on making this a habit, I’ve found that by praying as I promise, I am more likely to remember to pray about it again later. My knee-mail has a stronger connection because I’ve begun the communication. Compare it to those situations when you want to tell your best friend something, but the longer you delay, you can’t remember what you wanted to say. Even if it was huge! But once you’ve told your best friend, you’ve planted the conversation and are more likely to remember. Today, as you go about your day, when you are given an opportunity to pray for someone or a situation, don’t wait. Like that critical email you’ve got to get out to your team, take care of knee-mail now, so you don’t forget. Today, as you pray, ask God to help you with keeping these promises. Let’s make our prayers to God go viral as we send them heavenward.